Imagine what would happen in a game of chess, if your chessmen could acquire additional moving capabilities as they played? 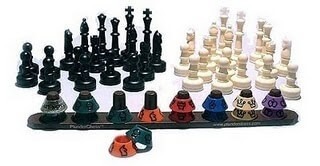 What if your queen could move as a queen or a knight and your pawn could move as a pawn or a bishop? How about escaping check by letting your king move as a rook? Well... Imagine no more. 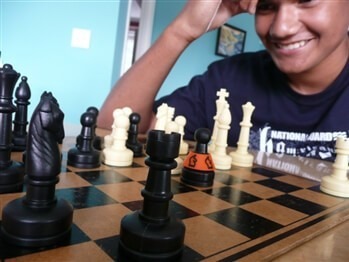 Brand new to the world of chess is the patented PlunderChess game. What is so unique about the game of PlunderChess? PlunderChess is traditional chess with a fun, novel twist. In its simplest definition, it is chess that allows each player the ability to strengthen their chessmen as the game is played out. This strengthening comes as the chessmen capture and "plunder" additional moving capabilities directly from their opponent's pieces. For example, if a bishop captures a rook, the capturing bishop may attach to itself a "rook vest" that now empowers it to move as a rook on one future move whenever it chooses. It is this unique "plundering" feature that makes PlunderChess a highly addictive, "got-to-play-more" game! "What if each playing chess piece could "take on", or "acquire" additional moving capabilities directly from the opposing piece it captures?" It was this exact question that seeded the beginnings of the game of PlunderChess! Now, over 15 years later, White Horse Games, LLC is delighted to offer the game of Plunder Chess. The PlunderChess® Game Set comes with everything shown, along with complete game instructions. 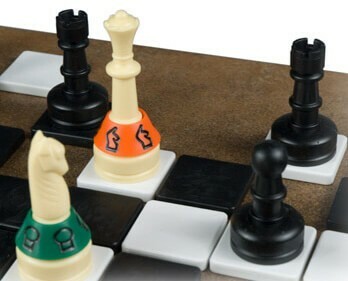 Extra king and queen included for use in playing other game variations.